Moving a mountain doesn’t necessarily mean the mountain itself moves. In the early nineteenth century, goods could only reach the Ohio River valley area from Charleston, South Carolina, by bypassing the mountains to the south and traveling north through Georgia and Tennessee. In 1835, residents of Charleston proposed a solution. 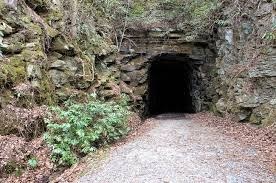 Why not construct a shorter route for the Blue Ridge Railroad by crafting a series of tunnels through the South Carolina, North Carolina, and Tennessee mountains? Things progressed smoothly until Stumphouse Mountain in Oconee County was encountered. After spending more than three years and a million dollars on this tunnel, the state of South Carolina refused to spend anymore. The tunnel remained unfinished with only 1,617 feet of the proposed 5,863 feet excavated. Some mountains simply refuse to be moved. Mountains in life aren’t geological structures but rather financial challenges, relationship turmoil, job loss, tragedies, natural disasters, death, rebellious children, and other unpleasant circumstances. Conquering them can be just as imposing as trying to summit Mount Everest. But moving life’s mountains doesn’t necessarily entail the mountain literally disappearing. A change of perspective may be all that’s required. With faith and God’s guidance, I can learn to look at the mountain from a different view and find contentment regardless of my surroundings and circumstances (Philippians 4:13). At the end of the day, I don’t move the mountain anyway. God does. I trust him to handle what’s impossible for me. With him, nothing is impossible. Whether he removes the mountain or simply allows me to see it from a different angle is immaterial. The mountain moves either way. Trust God to help you move your mountains. Prayer: Merciful and eternal God, when our mountains seem impossible to handle, nestle us by Your loving side, increase our faith, and move our mountains. Thanks to all our faithful followers who are "sharing" our posts--please keep it up! We also invite you to follow and like us on Facebook, Pinterest, and Twitter. Help us spread God's encouragement through his love lines. I have a friend in faith that use to think it is necessarily about the physical mountains that we see; she'll point to me and say, "see, if you have (and will point to a mountain closeby) you can moved that mountain, just believe in your heavenly father". But regulary I use to reply her, "oh yes, but not ordianrily those kind of mountains but also those situations that might look like mountains hindering us from moving forward and progressing! Our God is far more exceedingly powerful and able more than we can ever imagine!" Love that it can mean a change in perspective! Glad I visited from Hear It, Use It this morning. Blessings!